My grandson’s curls are running over his ears and away from the barber’s scissors. My mind quickly shifts to a few years back. I can see my college age son looking with understanding as I struggle to keep back the tears. I was watching his hair fall off his head and onto the floor. His features were subtly changing even as I knew he would be changed. He was getting a new short hair cut to last the many months he would be spending in India where the temperatures soar. Could he sense that I knew how hard this would be for him and how terribly I would miss him and how proud I was of him? I silently thanked God that I did not have to watch the heads of my sons being shaved before they went off to war and I thought of all the mothers, wives and girlfriends that did. 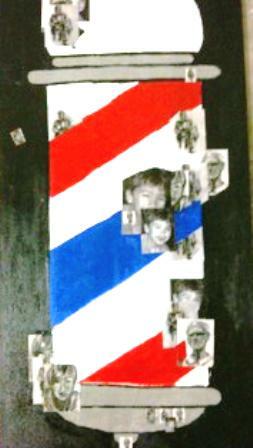 When my husband was 19 and headed for Viet Nam, did he have anyone there who mourned the loss of his fine gold hair? I have collected and stored the times I have watched my husband get his hair cut, looking so regal sitting up there on that throne in his robe with the Velcro collar. His barber tends to his grooming as he communicates a secret message to my soul when he catches me looking at him. I reflect on my good fortune to have captured the heart of such a man and he looks to see my reaction to his cut. I nod in approval. My dad never called it getting a hair cut but getting your ears lowered and when you get older, getting your ears lowered also means getting the wire-like hairs in your ears trimmed as well. Sometimes, a shave or an eyebrow trim is also part of the ritual and I can watch all this as an observer sipping on a small coke (in the bottle) that comes from an ancient machine, a familiar and friendly fixture in Tommy’s barber shop. All is handsome and masculine, masculine and handsome; even the newspapers, sports magazines, conversations and TV programs. 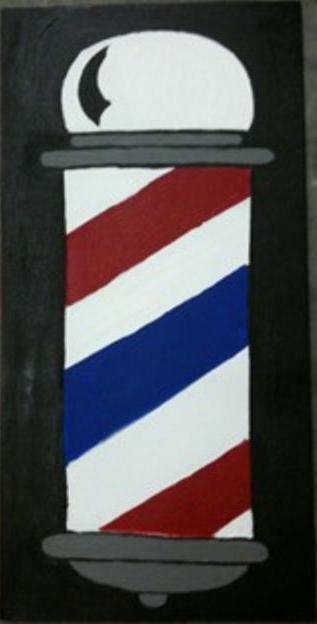 I wonder if the phantom of the barbershop finds the few wives and/or moms an intrusion. My oldest son, now married, always hated going to the barbershop. His coaches would say that his hair was too long and not to come back to practice until he got it cut. So, he would reluctantly have it trimmed. I remember the time that he and his friend died their dark curls, “blonde”. They both came down the stairs grinning and looking quite ridiculous with the Clairol shade 107 box in the bathroom trashcan and their hair an unnatural shade of red. The kids at school affirmed the new look, loved it in fact, because their friends loved them. But, Stephen’s mother was not amused and had him shave off the Ronald McDonald coif. I remember a boy in my junior high school who defied a strict hair code policy by growing his gorgeous blonde hair to the top of his shoulders. He was told he could not return to school unless he cut his hair. He did not return to school. I missed that boy. Then there were the two boys in high school that I went out with a few times. One wore his hair in a pony tail, the other in a “fro.” My dad hated them both. I liked them both. Watching the scissors snip and sculpt, I hear the tick and toc and see my sons as young boys, beautiful and free, wide-eyed and enchanting. Even when they were toddlers I would tear up every time that I took them to the barbershop. I sensed from the beginning that a barber shop is a place of sacred memories. I flash back to their first haircut when they cried big crocodile tears and had to sit up on a special booster seat within the big chair. They came out looking like little rascals’ characters, all slick and combed back. They were rewarded with lollipops which took some time to select and then moved quickly on as bigger boys to buzzes and crew cuts, straight hair and curly and I remember all the times that haircuts were mandatory for special days like proms and weddings and Big Daddy’s funeral. Grandfather and I am transported, momentarily into Papaw’s lap, breathing him in. The lives of all the men I adore rotate as the barber ceremoniously spins the chair around to show my grandson his new look, both front and back. He grins his tooth-less smile as I shallow hard and bite the corner of my cheek. I used to cut my boys’ hair. My older son’s had a perfect, natural wave that made it easy even for me to trim. My younger son put up with my amateur haircuts until he was six. Then, he demanded a professional barber. Cute post. thanks for the comment, Carol. Your son sounds like a man who knows what he wants! Your quiet a storyteller…very cute. From one grandmother to another…happy day to you. My dad was bald so he never went to the barber shop. My memories are of mom using a pair of clippers to trim his sparse hairs off. He would pull a kitchen chair out onto the back porch on Saturday mornings and she would give him his haircut. So sweet. My dad was bald so he never went to the barber shop. I have memories of my mom cutting his hair. Every Saturday morning he would sit in a kitchen chair on the back porch, right outside the kitchen doorway. Mom would use a pair of clippers to shave off the few sparse hairs. I love that…………thanks for stopping by…….on my way to your site. What a wonderful story. It took me back to my Dad who also used to go get his ears lowered! But I was lucky and he would often take me along. I remember those trips so clearly, it was a special time with Dad. His barber also gave out suckers and even thought I never got my hair cut there I always got a sucker. Thanks for the memories. So happy you have those special memories of your dad. Great story! I had boys too and they often asked me to drop them and not come in. In a room full of men they felt like ‘mamas’ boys I think. Consider linking up with me at Grandparents Say It Saturday. Would love to have you. My brother was among those that would grow his golden locks out. He wears it shorter now since maybe he saw a picture of himself and realized he was ridiculous. Most recently he took a picture of a european soccer player to the hairdresser and told them to do the same, so I guess he’s still a little ridiculous. Aw, this is so sweet! Thanks for sharing these precious memories. My father, who passed away in June at the age of 95, always insisted that I drop him off at the barber shop and pick him up. No place for women, he thought! Forget the haircuts……..! I want Mamaw’s tater salad, fried chicken of any kind and Richie Havens. Gwen, Gwen, Gwen! I love your haircutting adventure. I take my grandson’s to Floyd’s on Melrose in West Hollywood. Their sweet faces sit among all these tattooed, pierced, scary looking guys dressed in black getting their hair spiked in all directions which shaved areas here and there. They laugh and chat with the scary looking ones. Jackson and August leave with English school boy cuts. Priceless, Caroline – 2 completely different environments, two separate coasts and the same heart-tugging love. Gwen this is fantastic! You are good. Life seems to illusively come full-circle. I need to go back to Tommy’s Barber Shop tomorrow, you want to make it a date?